I have been a very good fan this year, rooting the Illini on in good times and bad, and judging the football season that just ended a few weeks ago, it couldn't possibly get much worse, could it? I paid my dues by buying season tickets, purchasing Illini merchandise for my family, and spending my hard earned money on concessions to keep them happy during these games. So, I do have a few requests as we embark on the year 2010 and hopefully brighter days ahead. I wish for these new coaching hires that have recently been added to all pull together and try to put a winning product on the field. I realize that it is not always the coaches that are the problem, but they do teach the players what to do, and so they usually shoulder their share of the blame. I realize Mr. Guenther, or as Ron Zook likes to call him, Coach Guenther (still haven't figured that one out), has a ton of faith in Zook, or else he would have sent him packing like Mr. Tepper and Mr. Turner before him. I was disappointed to see Reggie Mitchell leave for Kansas, but he evidently saw an opportunity and maybe thinks that a change of scenery is the best option for him. I wish him well. I would also like to see the recruiting improve, something that Zook has been able to hang his hat on in recent seasons. But, when a program that has been up and down (more down) like our beloved Illini, I cannot really blame players if they don't want to come here and play. It is, after all, a matter of choice. That being said, would a trip to a bowl game be too much to ask for? Usually, we don't have any plans around the holidays except for watching other teams play in games like the Las Vegas Bowl and the Poinsettia Bowl. It would be nice to have the Illini play in a bowl of their own, maybe like the Sun Bowl or one of those in a warm weather climate. Beats spending Christmas and New Years in the cold and dampness of the Midwest. Now, on to basketball. I really like the job that Bruce Weber is doing with the basketball team, although he does have his critics that think he could do better. Every season we look forward to the start of practice during football season, and anticipate the first exhibition game, which leads to the start of the regular season. The Missouri Braggin' Rights game is always a fun time, and or course, there is the United Center game at the home-away-from home. One thing, Santa about the basketball team that I would like to see change is for the team to develop some heart to finish strong down the stretch. I know basketball doesn't take as long to turn around a program than a football team does, but our 3 losses this year all have came to mediocre teams that have simply wanted it more than we have. You couldn't ask for more talented freshmen than what we have, and what is coming further down the road makes me just giddy with anticipation. Yet, this business of getting to the NCAA Tournament and lasting just 1 or 2 games is getting a bit old. Schools rich in basketball tradition like Duke, North Carolina and Kansas seem to do it every year. Why can't we be like them? Thank you for taking these wishes to heart, Santa. I will be sure to leave you cookies and plenty of orange and blue kool-aid for when you come. Have fun going around on your big night. Football season has been over for almost 2 weeks now (at least on the campus of the University of Illinois - and some would agree that it has been even longer than that. ), and yet the program still is making news. Late last week, Ron Zook made headlines by firing four assistants on the offensive side of the football. Offensive coordinator and tight ends coach Mike Schultz, as expected, was one that was let go, as was quarterbacks coach Kurt Beathard, receivers coach Jim Pry, and special teams coordinator Mike Woodford. Also making changes on the defensive side of the ball, Zook demoted Curt Mallory and Dan Disch, who were co-defensive coordinators this past year. They will remain as position coaches on defense, and the search was on to find a defensive coordinator with some high credentials. Action such as this is typical at the end of a season, especially for schools that aren't "going bowling". Many have expressed that is should have been Zook that was out the door, but athletic director Ron Guenther is sticking by his claim that Zook was safe at least for another year. Now, I am sure that all bets are off if the Illini happen to tank again next season, and then you probably will see a change at the top. Early this week, rumors began to surface of possible replacements that were making their way to Champaign. On Tuesday, those reports were confirmed as Paul Petrino was named the new offensive coordinator. Petrino, who is the brother of former Louisville and current Arkansas coach Bobby Petrino, comes to Illinois with some good credentials and a love of an "open offense" that will, in his own words, "FTS (Feed The Studs). Other reports have Jeff Brohm and Greg Nord both headed to Illinois from Louisville to fill offensive position needs. I had a chance to speak to Petrino after his introductory press conference and asked him point blank if the offense that he plans to bring to Illinois is what he ran at Arkansas. He assured me it was. So, those of you that are excited for the upcoming bowl season to start, be sure to watch Arkansas in the Liberty Bowl on January 2. You will get a good idea of what the Illini will be showcasing. Petrino mentioned that he will employ an offense that will involve the tight ends more. Well, that could be an issue with the recent graduation of Michael Hoomanawanui and Jeff Cumberland, coupled with the transfer of Hubie Graham. This leaves Zach Becker and Justin Lattimore as the only players at the position that have actually seen time there. Also, losing highly touted prospect C. J. Fedorowicz begs the question, why wasn't this done a month ago? What harm would it have done to try and keep this prospect, that is going to Iowa? Petrino will be without one of those "studs" come next season, as on Wednesday Arreliou s "Regus" Benn (right) made his decision to forego his senior season and enter the 2010 NFL draft. This was not a shocking revelation, as everyone knows what Regus can do and he is still being projected as a high first round pick on draft day. One wonders what might have been had he not been dealing with injuries this season, or was thrown to more than he was. Still, it's a business decision and one that makes sense to me for him to make. I wish him well, but will miss seeing #9 running the sidelines catching passes and also that infectious smile. The Assembly Hall normally plays host to men's and women's basketball, among other events throughout the year. However, for the past four years, the Assembly Hall has been the venue for an event that showcases some of the best high school talent in the state of Illinois. This year is no different, and to go one step better, there are teams from 2 other states involved. The main focus of the shootout is to bring in the players and teams that the Illini have either recruited or are on their radar in terms of being looked at. The shootout was given an extra measure of credibility when former Illini star and current Utah Jazz player Deron Williams lent his name to the event. In the first game of the shootout, Rich South defeated Champaign Central 53-47 in a game that was tight all the way through. Central is one of the local teams, and features a sophomore by the name of Jay Simpson that is already committed to play at Purdue. Rich South, who was missing their star Crandall Head, younger brother of former Illini Luther Head, played pretty well without him. Crandall is committed to the Illini and will join them next season along with a couple other players competing in the shootout. The second game of the day featured a couple of teams, one with strong ties to Coach Bruce Weber. Glenbrook North, who produced Jon Scheyer, now at Duke, is coached by Bruce's younger brother David Weber. One of the better players for Glenbrook just happens to be Weber's son, Austin. (Yep, Bruce's nephew). This was a low scoring affair, with the Spartans coming out on top over Peoria Notre Dame 41-23. Glenbrook North moves to 8-0 and has one of the better teams in the state in Class 4A and also feature Jordan Liss and Alex Dragicevich, the latter of which is headed to Notre Dame next year to play basketball. The Irish have a decent player on their team as well, his name being Max Bielfeldt, and he led them in scoring with 8 points. The third game of the day featured one team that needs no introduction to the state of Illinois, and the other one making their shootout debut. Peoria Manual, who was dominant back in the 90's, still is pretty good, and has produced countless talent to the Division 1 level. Many of those players have come to Illinois, among them Sergio McClain, Marcus Griffin, Frank Williams, and Jerry Hester. Marvin Jordan was one of the players to watch for the Rams, and he didn't disappoint, scoring 10 points. Bowman Academy, which hails from Gary, Indiana, has a superstar of their own in DeJuan Marrero, who lived up to his expectations as well by scoring 20. Marrero is only a sophomore, and at 6'5, still has a lot of growing to do. He is on the radar for the Illini as well. Bowman Academy defeated Manual 69-50 t0 stay perfect on the season. Game four of the day featured the first overtime game of the shootout, a 68-62 victory by Chicago Mt. Carmel over Peoria Central. Mount Carmel features an Illini commitment, Tracy Abrams, who is a 6'1 junior. Abrams has been on the radar of the Illini for quite a while, and will be joining them in the class of 2011. Peoria Central features a young star in the making of their own in Antonio "Bobo" Drummond. Although Drummond didn't lead the Lions in scoring (2 other players each scored 16), he promises to be a good player and can even get better than he is now. The fifth game featured another player that will be wearing the orange and blue next year for Robinson. Meyers Leonard, who stands 7'0 tall and will be joining fellow Illini junior Mike Tisdale on the front line next year. However, Rock Island, who played the Maroons, has a superstar in the making as well by the name of Chasson Randle. Randle, who is a junior, still has Illinois in his sights but won't make a firm commitment for a while yet. The Rocks defeated Robinson 58-53 behind 28 points by Randle. Leonard scored 16 for the Maroons, who are a much smaller school than their counterparts. Game six of the day featured another local team, the Champaign Centennial Chargers, facing the Waukegan Bulldogs. Centennial, who is the defending Class 3A state champs, is off to another undefeated start and features a team loaded with talent. Rayvonte Rice, who is headed to Drake, is the real deal, and the folks in Des Moines, Iowa are lucky to be getting him. Also on the Chargers' roster is Jeff Johnson, who will take his game to Eastern Kentucky next year. Waukegan, who features yet another recruit for the Fighting Illini (notice a trend yet?) in Jereme Richmond. Richmond, who has been committed to Illinois since he was an eighth grader, has kept the commitment firm and despite some troubles that led to switching schools midway through high school, never wavered. Plus, his game has gotten better as well and should be a good fit for the Illini next year. The Chargers kept their unbeaten streak alive by defeating the Bulldogs as Rice scored 32 points to lead his team to victory. Richmond will look good in orange and blue as well next season. The final game of the evening pitted two prep schools who have already played twice this season. Quality Education Prep from Winston-Salem, North Carolina took on Brehm Prep from Carbondale in a game that could have resembled a college game with the talent on the floor. The two teams played on Friday night, with Quality Education coming out on top in that one. Brehm lost their best player, James Siakem, due to several broken bones in his face. He is apparently headed to New York for surgery soon. Quality Education boasts a roster that most college teams would love to have with five players standing 6'8 or taller. Their marquee player is Quincy Miller, who may have the most talent of anyone in the shootout field. The Pharoahs play a national schedule, which could stand the reason why they are so talented. Brehm, who without Siakem, still only lost 76-74, made up for their star player's loss by getting 24 points from Bruce Barron in their defeat. I think that the cupboard for Illini hoops in the near future looks pretty full and great things might be in store. And, mercifully, this football season is over! In weather more befitting caroling, the Fighting Illini saw their 2009 season come to a crushing and heartbreaking end as they dropped a 53-52 decision to the Fresno State Bulldogs last Saturday afternoon at a frigid Memorial Stadium in Champaign. This has been a season of disappointment for the Illini, most notably because of the lack of play on the field not being consistent with the level of talent. Several times on Saturday the Illini had the Bulldogs right where they wanted them, but every time they managed to find a way back into the game. What happened at the end of the game was a fitting end to the entire season. With the Illini leading 52-45 late in the game, the Bulldogs got the ball back and moved down the field with relative ease. With time running out, Fresno State appeared to score a touchdown, and video replay evidence confirming that ruling, the decision was whether the Bulldogs would kick the extra point to tie and send the game to overtime, or try for the two-point conversion and try to win it in regulation. After a series of timeouts, Fresno decided to go for two, and got it on a deflection to an offensive lineman. That play also was reviewed, and ruled a conversion, sending the few thousand fans in attendance home stunned, yet probably not surprised at how the game ended. Juice Williams and the seniors deserved better, and as Ron Zook had said several times in the week preceding the game, these players came to Illinois at a time when it was not popular to do so. So, where does this leave the program? Not good, by any stretch of the imagination. Recruits are decommitting, players are leaving the team for various reasons, and what it all boils down to is a recruiting class of just 8 players for 2010. Yes, 8. How did things get so bad so fast? You can start at the top with that question. Known as a good recruiter coming to Illinois, Zook has proved that he can get the players here, but coaching them and, ultimately, keeping the players here is an entirely separate issue. It is no secret that there will be some coaches that will be searching for new jobs soon, and one wonders just how firm athletic director Ron Guenther was in his "vote of confidence" for Zook midway through this season. Under the current circumstances, this cannot continue. The program is getting a bad name, but Illinois has never been known as a football school anyway. In the last 14 years, the Illini have been to just three bowl games. That is down right embarrassing compared to schools such as Ohio State, Penn State, Michigan, and even Purdue. Still, a lot of these player defections that have surfaced the past few days are just rumors and not confirmed yet. What ultimately will happen if any more recruits de-commit is that Zook, or whomever, will be offering players that may not have been considered for Big 10 programs. This is not good, folks, and it doesn't appear to be getting any better soon. On to some much better news. Following their stunning come-from-behind win over Clemson last week, the Fighting Illini returned to the Assembly Hall for the first of 3 games before final exams on campus. Saturday night the Illini entertained Boise State, and even though they didn't play very well, still escaped with an 84-77 win. You expect the Illini to play the lesser name schools better, but for some reason, they let the Broncos hang with them for much of the game. When the Big 10 season begins later this month, this type of play will need to cease or else the Illini will find themselves on the losing end of most of those games. The freshmen still continue to impress, and another one made an impression in the win over Boise. Tyler Griffey, from Wildwood, Missouri, had his best game of his Illinois career, showcasing his shooting touch from outside. Then the Illini welcomed Vanderbilt, a team that they defeated a year ago in Nashville. The Illini prevailed against the Commodores as well, 79-68, as Demetri McCamey scored 23 points to lead his team to victory. The freshmen came alive once again, as D. J. Richardson added 16 for the Illini as they moved to 7-2 on the season. The win over Vanderbilt was also the second win over a top 25 team this season. Illinois was in the top 25 at one point this season, but the Vegas trip put the kabosh on that real quick. The Illini continue their season this Sunday against Western Michigan (1:30 pm, Big Ten Network), before the annual Border War game against Missouri shortly before Christmas. The Fighting Illini women's volleyball team survived the first 2 rounds of the NCAA Tournament, and will now head west to face Hawaii, and most likely Stanford. The Illini got by Indiana-Purdue-Fort Wayne and Dayton in the first two rounds played at Huff Hall, and will now see how they stack up against the likes of the elite in the nation. This region is stacked to begin with, seeing as the latest AVCA rankings had Stanford #3, Hawaii #4, and the Illini #5. Coach Kevin Hambly enjoys this level of competition and feels that they can compete and get a spot in the final four. Finally, Jolette Law has the Illini women's basketball team playing some of the best basketball that the program has seen in many years. After an opening season loss to Temple in a game that the Illini had a sizable lead, they have run off 7 straight wins to give the program a little respectability and a lot of hope. On Wednesday evening, Marquette paid the Illini a visit, and unfortunately for the home standers, defeated Illinois 65-55 in a game that was televised on the Big Ten Network. That still leaves the Illini at 7-2, which is not a bad start to the season. The conference portion of the schedule begins soon, so Law will need to keep her team playing well if it wants a chance to play in March. Stay tuned. Bruce Weber's Fighting Illini finished up the Las Vegas Invitational in Sin City over the Thanksgiving holiday, and came up with a result that was not to their liking, or anyone else's in Illini Nation. The Illini breezed through the first two games of the invitational, defeating Presbyterian and Wofford, and headed west to face Utah and what looked like Oklahoma State for the title. Well, sometimes things don't end up like you expect them to, and the Illini blew a 16 point halftime lead to the Utes and ultimately fell 60-58 on a runner by Shawn Glover at the buzzer. The Illini freshman duo of Brandon Paul and D. J. Richardson, who looked very good for the first four games of the season, found that life away from the Assembly Hall isn't the same as playing in front of the home fans. In fact, the two need to learn quite a few things or else all of the road trips and neutral court games will end up in a similar fashion. Weber says that he is still looking for a leader to emerge on this team, and the challengers right now seem to be Mike Tisdale and Demetri McCamey. McCamey scored 19 points and Tisdale added 18 in the loss, but others will have to step up and help these guys out. On Saturday night, the Illini played for third place against the Bradley Braves, and it was a tight game for the entire contest. Mike Davis led the Illini in scoring against the Braves with 17 points, while Tisdale added 12 and McCamey chipped in 10 points. However, Bradley handed the Illini their second consecutive loss, 72-68, and sent the Illini home with a fourth place finish in the tourney. It was far from the expectations that they had going out there, but then again, this is a team that still has to gel together and fill in the missing pieces left from last year. The Illini get a chance to start another winning streak on Saturday evening when they welcome Boise State to the Assembly Hall (6:30 pm, Big Ten Network). This week begins the 11th annual Big 10/ACC Challenge, which up to this point has been dominated by the ACC. The Big 10 has never won a challenge, and really haven't come close in any either. However, as I type this blog, the Big 10 has a 3-1 lead and are splitting the final two games of the evening. They could very easily go into the final day of the event needing just 2 wins to capture their first ACC/Big 10 Challenge and bragging rights for a year. The Illini have drawn as their opponent the Clemson Tigers, which they play for the second consecutive year. The Illini lost to Clemson 76-74 last year in Champaign, and will play on Wednesday (6:15 pm, ESPN) at Littlejohn Coliseum in Clemson, South Carolina. For the Illini to get past Clemson this time around, the freshmen will need to grow up and play like upperclassmen and forget that they are first-year players. Also, someone, anyone, needs to step up and become a leader on the floor. That way, when things start going south like it did in Vegas, there can be someone to step in and get them back on track. Ron Zook and his Fighting Illini football team will put the wrap on the 2009 season this Saturday when they welcome the Fresno State Bulldogs (11:30 am, Big Ten Network) to a cold Memorial Stadium for the first ever college football game in the month of December. Sure, the year the Bears played at Memorial Stadium there were December games, but the NFL is used to playing in this month. So, too, are football programs that are perennial bowl contenders. Illinois is not one of those such programs. It might be a different story if this game meant something, but it doesn't mean anything to the Illini. It is senior day, and Juice Williams' final game as an Illini, as well as for a host of other seniors playing their final game in front of the home crowd. It hasn't been easy for this group of players, and according to Zook, they came to Illinois at a time when it wasn't popular to do so. In fact, Williams committed to play for the Illini the night that Penn State defeated Illinois 63-10. Sure, it could have been better, and for all intensive purposes, it should have been better. But, this is Illinois. Not known as a football school, and the way this season has gone, that moniker won't change anytime soon. Coach Jolette Law has the Fighting Illini women's basketball team off to a 6-1 start on the season, the best start in nearly a decade. Law had her troops out in San Luis Obispo, California in a tournament that they won, defeating Cal Poly (56-47) and Alabama (64-55). Senior Jenna Smith continued to dominate, averaging 21 points and 15 rebounds in the tourney. Smith has posted a double-double in 6 of the 7 games that the Illini have played in this season. The women will travel to Winston-Salem, North Carolina on Wednesday evening to take on Wake Forest in the women's version of the ACC/Big 10 Challenge. The Illini will next take the court at the Assembly Hall on December 9th, when they host Marquette at 8:00 pm. When Kevin Hambly took over for Don Hardin as women's volleyball coach, nobody expected him to continue the success that the program had developed over the years. But Hambly has done exceptionally well, getting his girls into the NCAA Tournament and hosting a first and second round matchup this Thursday and Friday at Huff Hall. The Illini fell to Minnesota in their final match of the regular season, but still managed to get the fifth overall seed in the tournament, pairing them with Stanford in the regional. The Illini draws as their first round match the Mastadons from Indiana-Purdue-Fort Wayne (IPFW) (7:00 pm), who are making their first tournament appearance. If the Illini can get past IPFW, they will play the winner of the other match, Milwaukee vs. Dayton on Friday. The winner leaving Champaign gets to travel to Stanford to feed into that regional. Rather than start with football like I normally do in the look back each week, basketball will take the lead this time around. When the middle of October rolls around each year, no matter how the football team is doing, it means that basketball season is just beginning. Bruce Weber and his Fighting Illini men's team is turning heads once again, as he welcomes a freshman class of four players to the already budding group of stars in the making. When Jerrance Howard joined the coaching staff from Kentucky 3 years ago, the foundation was laid for recruiting to get back on track. Jerrance just has this repoire with talking to guys, and when he played, you could tell that his enthusiasm would be put to good use. So, you can say that the current group of newbies that include D. J. Richardson, Brandon Paul, Joseph Bertrand, and Tyler Griffey, was due in large part to Howard. After all, Jerrance is a Peoria guy, and that is where D. J. hails from. Last season, however, Richardson spent the season playing at a prep school in Las Vegas to hone his study skills and maybe, just maybe, to get some basketball savvy as well. The results so far have been well received. The Illini held their annual Orange and Blue Scrimmage last Sunday afternoon at the Assembly Hall, and the sparse crowd on hand was treated to something they hadn't seen in quite some time, which was good, outside perimeter shooting. The freshmen all looked pretty good, most notably Richardson, who really was stroking it from beyond the arc. Bertrand, who has been dealing with an ankle injury, looks like he is ready to go, as does Paul. Griffey, the one big man in the class, looks as if he may contribute more than first thought. The surprise of the scrimmage, in my opinion , was the play of Alex Legion. When Legion transferred from Kentucky in December of 2007, he was talked about as being a good shooter and a nice complement to Demetri McCamey. However, he didn't exhibit that once he became eligible last December, and struggled to find his shot. That all has appeared to change, as he led all scorers in the scrimmage with 28 points, including about 5 in a row from 3-point range. Such flair will be a welcome sight to Illini Nation once the season gets rolling. Speaking of McCamey, last season he was known to clash at times with Weber and didn't always see eye to eye with his coach. According to Weber, he is seeing things much clearer as the new season begins, and it is showing so far in his play. He, too, seems to be shooting the ball much better and moving with more grace as a result. A welcome sight was that of Jeff Jordan, who rejoined the team just before the "Spike The Record" event. Jordan was in attendance for the opening night scrimmage, but did not take part in the festivities. Weber said that if Jordan was willing to work and catch up for all the workouts that he has missed, then he would be welcome to rejoin the team. I think he still has some game left in him, and quite possibly may be a big help to the team later on in the season. The Illini begin their season with the first of two exhibition games on Friday night when they welcome Division II Missouri Southern to the Assembly Hall. What that will tell us may not be much, but at least it will be a chance to play a game against someone else. By now everyone knows that during halftime of last Saturday's Illinois-Purdue football game in West Lafayette, University of Illinois Athletic Director Ron Guenther issued a statement, albeit brief, giving Ron Zook a vote of confidence and also stands behind him as coach through the end of the 2010 season. Now, for what it's worth, the last time a promise like this was made, a coach was fired at the end of the same season that it was issued. Ron Turner got the vote of confidence in 2004, and was promptly fired at the end of that season. As has been mentioned often over the past few weeks, Guenther is a football man and will stick by his coach until he sees the need to let go. But how do you gauge when enough is enough? When ticket sales start to sag? When donors stop giving? When the high-priced luxury boxes don't get renewed? It's no secret that Zook hasn't exactly had a successful career at Illinois, save for the one season when they went to the Rose Bowl. Back to the game with the Boilermakers, the Illini looked like they were going to do something early on when they actually took a 7-0 lead early in the game, only to see Purdue march right back and tie the score. That is where the fun stopped. A bright spot in the game was the play of redshirt freshman Jacob Charest, who performed admirably in his first collegiate action. Leading the Illini down the field near the end of the first half, they got inside the 10 yard line when Zook made a move that is still being questioned. He brought Juice back in because they wanted to control the line of scrimmage and run the ball in. Couldn't Charest of handed the ball off as Juice did? After all, he was the one that got them in that position. Well, the series ended in disaster as Matt Eller missed a chip shot of a field goal. Pretty much sums up the Illini season thus far. The Illini get a chance at redemption this coming Saturday (2:30 pm, ABC) when the hated Michigan Wolverines come into town to play. Now, I don't mean to offend any Michigan alums that may read this, but the Illini and the Wolverines have a history that goes way, way back. The Illini beat Michigan 45-20 a year ago in Ann Arbor, a game in which Juice Williams set the Michigan Stadium record for total offense in a game by a single player. That is quite a record to obtain, given all of the talented players that have played inside those walls. This could be a shot of redemption for the Illini if they can find some way, any way of knocking off the Wolverines. At 1-6 overall and winless in 5 tries in conference play this season, the Illini are looking for any positive signs in what has been a very dismal season. Zook stated in his weekly press gathering that both Williams and Charest would see action, although he wasn't annointing one above the other. He also hinted that the kicking duties may change as well, given Eller's miss against Purdue. Will one win do anything for this sinking ship that keeps taking on water? Maybe not, but if it's against Michigan, at least you can feel good about something. The women's volleyball and soccer teams continue their seasons, and appear to be headed in opposite directions. The volleyball team defeated Wisconsin in 4 games and Iowa in 3 games last weekend to up their record to 16-3 overall and 8-2 in Big Ten play. The Illini are currently ranked #6 in the latest AVCA poll, and will travel to Indiana and Purdue this weekend to try and continue their winning streak. The soccer team has endured a tough week, falling twice without scoring a goal. The Illini lost to #19 Ohio State last Thursday 3-0, and then fell to Penn State 6-0 on Sunday. The Illini are 6-7-3 overall, but just 1-4-2 in conference play. They will try and right the ship this weekend when they welcome Michigan State and Michigan to the Illinois Soccer Stadium for the final two home matches of the season. Gotta love the sports seasons when they overlap! I really don't know where to begin here, so I'll just start at what I call the beginning, or maybe it is the end. Like the character Phil Connors in the movie Groundhog Day, this Illini football season seems to be repeating itself each and every day. It's like a dream that will never end, a story that has the same plot time and time again. No matter what the Illini seem to do, it always ends up being the wrong course of action. It has become so bad in Champaign that the Illini cannot even get out of their own way. Rewind to Saturday's game against the Indiana Hoosiers for a minute for a specific instance to the last comment. The Hoosiers decided to pooch punt to the Illini to back them up deep in their own territory. Instead of taking a bounce that the Hoosiers would down, the ball hits Russell Ellington, who had his back to the play, resulting in Indiana falling on the ball inside the Illinois 20 yard line. Plays such as these are indicative of how the season has gone for the Illini. In the 27-14 loss, Juice Williams didn't move the ball badly at all, but he had problems hanging on to the football, fumbling twice inside the red zone and foiling a golden opportunity to score each time. Plays like these, along with the personal foul penalties have long plagued the Illini, but the troubles go well beyond this. So how did Illinois get so bad so fast? Ron Zook is like a broken record, saying things like "we are not playing the way we are capable of playing" and "we'll get down to basics and fix what is wrong". Well, how's that working for you, Ron? The Illini fan base is tired of hearing these promises, and changes are needed. First, Mike Schultz as offensive coordinator has got to go. When Mike Locksley left for New Mexico, the link between coordinator and quarterback was broken, and it is clearly evident that Schultz doesn't have a clue what is going on. Locksley has his own issues since he took the New Mexico job, and I think I would welcome him back in a second if given the chance, despite all of the problems he has endured. The offensive line also has regressed, and I believe that is a direct reflection on the coaching change at the position as well. When Tom Sims was shown the door before the season, they brought in Keith Gilmore, and the results so far speak for themselves. Not really sure what happened with the Sims situation, but it is clearly evident that the O-Line is not what it was. Finally, the university needs to address the athletic director position as well. Ron Guenther has made some good hires in his tenure, but since he prides himself on being a football guy, shouldn't he bring in someone who can win on a consistent basis? Is that too much to ask? What we are looking at, I believe, is a Ron Zook deathwatch. The Indiana game appeared to be winnable, even after this train wreck of a season started barrelling out of control downhill. Now, what we are left with is the strong possibility of a 1-11 season, because looking at the schedule there doesn't appear to be any winnable games left. Purdue, the next Illini opponent, just upset Ohio State and are resurrecting their dismal start to mere respectability. After that, Michigan comes into Champaign and always plays the Illini tough in our house. Next the Illini go to Minnesota to play outdoors for the first time in Minneapolis. I really don't think it would matter if you played the game on Mars, the Illini don't stand a chance. Northwestern comes calling the week after, and they are probably the only real chance that the Illini have to somehow steal a win. The Illini will then close out the season with a couple of non-conference game, the first being the day after Thanksgiving at Cincinnati. The season will conclude on December 5th when the Illini welcome Fresno State to Memorial Stadium. Given the performance of the Illini this year, it will be stretching it to assume a crowd over 20,000 for that game. For those of you that remember Monty Python, Now for something completely different. Last Friday night kicked off the 2009-2010 basketball seasons for both the men's and women's teams at the University of Illinois. In an event that was marketed as "Spike The Record", the women's volleyball team preceded the basketball by hosting #6 Minnesota. The volleyball was exceptional, as the Illini beat the Gophers in 3 straight matches to improve their season marks to 14-3 overall and 6-2 in Big Ten match play. The event was targeted to set an attendance record for a volleyball match, but that fell quite a bit short, as only 7,632 were on hand to see the match. Early this week it was discovered that even if the Illini would have set the record, it wouldn't have counted because it was a shared event, and the record would qualify only if volleyball was the sole game being played. Once the volleyball was over and the court was cleared, it was time for Bruce Weber and Jolette Law's basketball teams to be introduced. There is excitement building for both programs, as each welcomes a top 25 recruiting class. On the men's side, freshmen D. J. Richardson, Joseph Bertrand, Brandon Paul and Tyler Griffey made their first appearance on the Assembly Hall court to raving applause. Maybe it was just a diversion from the sorry state of affairs across the street at Memorial Stadium, but nevertheless, the hoops action was still good. After the introductions, there was a shooting contest involving both programs, as well as a slam dunk competition from the men. I often wonder why they don't let the women scrimmage a little bit, especially this talented group of players. Coach Law brings in Karisma Penn, Adrienne Godbold, Amber Moore, Kersten Magrum, Brianna Jones, and the best of the lot, Destiny Williams into a program that is clearly on the rise. Only finishing the season with 8 players a year ago, Law has 14 players this time around, and joked at Media Day by saying that she had an abundance and wouldn't know how to coach that many players at once. Destiny Williams will be one of the most talented players to ever wear the orange and blue, and she should be a fun one to watch. The men should be equally fun to watch, as this group of freshmen can fly like a certain group that ended up being on one of the greatest teams in Illini history. No, I'm not saying that this band of freshmen are the next Dee Brown and company, but there hasn't been a recruiting class this much talked about since that group arrived. So, despite the ineptness of the football team, with the start of basketball season brings renewed hope to Illini Nation. After what this fall has produced thus far, isn't that all that can be hoped for? Things just seem to get more interesting around the Fighting Illini football program. Just 2 days after losing to Penn State, Coach Ron Zook benched starting quarterback Juice Williams in favor of junior Eddie McGee for this Saturday's contest against Michigan State (11:00 am, Big Ten Network). Williams, who set the Illinois record for total offense in the loss to the Nittany Lions, has struggled to find open receivers in their three losses. The lone victory over Illinois State was led by McGee, who stepped in for Williams after the first play in which Juice got hurt. But bear in mind, this bunch of Spartans are much more talented than the Redbirds that visited last month, so McGee may find the road a lot more difficult this time around. As Zook stated in his weekly press conference on Tuesday, this is not just about Juice and the way he has played. Sometimes it takes a shake up to get things going in the right direction. That is all fine and well, but how about some of the other positions? Maybe it's just not who is running the offense, but the system itself. When Mike Locksley was in charge of the offense before his departure to New Mexico, things seemed to run okay. Locksley did have his critics, but his replacement, Mike Schultz, seems to be running something entirely different. Gone are the looks downfield to the talented corps of receivers. We all know what Arrelious Benn can do, so why not let him show his skills? Jarred Fayson has proven that he needs work on catching balls, but when he does, he looks as fast as anyone on the field. Schultz said at the beginning of the season that the offense wouldn't be much different than they ran last year, but I am beginning to believe that is not the case. Is it time to push the panic button yet? According to Zook, the answer is no. He thinks there still is enough time left for the Illini to turn the season around. With the tough part of the schedule nearly done, the opportunity presents itself in the next few weeks to stockpile some wins together. That can begin as soon as this weekend, but it will take more of an effort across the board to make that happen. Could there be a possibility of seeing Juice somewhere else on the field Saturday? Zook wouldn't totally dismiss the idea, only saying he wouldn't be on the offensive line or somewhere like that. McGee has been used as receiver in certain sets before, so if Juice can catch a pass, who knows? Everyone already knows that he can run, so that is something to think about too. Maybe he can teach Fayson or some of the other receivers who have developed butterfingers a thing or two. It was a good weekend for former Illini players that have taken their game to the next level. Rashard Mendenhall had a great game for the Steelers, scoring 2 touchdowns and breaking the century mark in rushing yards. Vontae Davis, who was drafted by the Miami Dolphins, returned an interception for a touchdown, the first of his career. It's always nice to see former players excelling in the NFL, but it begs the question of why can't the current players get their act together? After all, playing on Sunday is the ultimate goal of many of these athletes. Michigan State is a hard team to figure out this year. Coming into their matchup against the Illini on Saturday, the Spartans are 2-3 overall and 1-1 in the Big Ten, and riding an emotional high after upsetting Michigan 26-20 last Saturday at Spartan Stadium in East Lansing. They employ a dual quarterback system, with Kirk Cousins and Keith Nichol sharing duties. The tandem combined for 303 total yards against the Wolverines with Cousins getting the bulk of the work. The Spartans have beaten the Illini 9 out of the last 10 times, with the Illini last winning at home way back in 1992. The Illini women's volleyball team split a pair of matches last weekend, dropping a heartbreaking contest at #23 Michigan State on Friday night, before rebounding on Saturday night to down Michigan. The Illini couldn't finish off the Spartans, even though they had 3 match points in the fourth set. The momentum shifted, and the Spartans came away with the victory. The Illini are 10-3 overall and 2-2 in conference matches with Purdue and Indiana coming into town this weekend to do battle. The Illini women's soccer team had a tough road stretch last weekend, and finished with a 0-1-1 record. On Friday night, the Illini dropped a 1-0 decision to #12 Purdue, only the second time that they have been shut out this season. On Sunday, the Illini managed to tie the Hoosiers 1-1, as they went to double overtime against Indiana before ending in the deadlock. The Illini 5-4-3 overall on the season, with a Big Ten mark of 0-1-2. The Illini host Wisconsin on Sunday at the soccer stadium on campus. Match time is set for 1:00 pm. Stop me if you have heard this before. The Fighting Illini is loaded at the wide receiver position and should have no problem putting points on the board this season. This was the main topic that was being discussed before the current Illinois football season began. Now three games into the season, Illini Nation is still looking for this potent offense, which resembles a wounded duck rather than an air attack. So, what's the problem? Personally, I see the problem being several factors. First there's the coach. When Ron Zook was hired before the 2005 season, the Illini were looking for a change as the Ron Turner era came to an end in Champaign. Zook had been fired from Florida after 3 seasons in which he compiled a 23-14 record and led the Gators to bowl games in each of those 3 seasons. The knock on Zook coming out of Gainesville was that he was a great recruiter, but not that good of a coach. Could it be that the folks down there were right all along? Zook's recruiting resume spoke volumes, as he continually brought good talent down to Florida. Part of the credit for the Gators' national title last season could be attributed to Zook in bringing the talent to the school as well, although he didn't actually coach the players to that title. Since being at Illinois, Zook has compiled a 19-32 record through Saturday, a 30-0 loss to Ohio State (more on that game later). Some of that record can be blamed on Turner and the shape he left the program when he was fired after the 2004 season, but with Zook's reputation, people figured that better days were ahead on the horizon. And Zook has done his part in bringing talent to Illinois as well, with the last 3 recruiting classes garnering national attention. So, with talent like that, one would think that the Illini would have had multiple bowl opportunities, right? Wrong! The Rose Bowl in 2007 had been the team's only post-season appearance, which is unacceptable on many levels. Sometimes the coaching staff in general can be a culprit, and the departure of Mike Locksley to New Mexico late last season created an opening at the offensive coordinator position. All Locksley did was land some of the best talent from the Washington D.C. area and lure them to Champaign. Guys like Arrelious Benn, Will Davis and others worked out pretty well, while guys like Derrick McPhearson and others from the same area did not. When Zook was hired at Illinois, he brought 3 assistants with him. Two of those (Larry Fedora and Joe Wickline) took other jobs within a week after being hired, leaving Dan Disch as the only person heading north with Zook Could these other two gentlemen have known something? Did they want to get out from under the Zook umbrella? Nobody will know for sure unless they are actually asked, but it does lead one to believe that they sensed something ahead of time and didn't want to make a mistake with coming to a place that they didn't want to. As the four and five-star recruits continue to gather in Champaign, the program doesn't seem to be moving in the right direction. Which leads me to the players. Are the players too over-hyped? The list can be endless of talent that Zook has brought to Illinois over the past few seasons. Juice Williams, Arrelious Benn, Rashard Mendenhall, Reggie Ellis and others come to mind right off the top, but sometimes the execution of players' talent can be the difference between good and great. Williams was supposed to ease into his senior season with an arsenal of weapons on offense that would generate a points explosion on the scoreboard. After 3 games, the Illini have a grand total of 54 points, only 9 of those that have been oriented by Juice. In the game where the Illini scored 45 points, Eddie McGee led the offense after Williams strained his quad on the opening play from scrimmage. Such ineptness has clamored that it might be time for a change at quarterback. After Saturday's 30-0 pasting at the hands of Ohio State in Columbus, the groans grew even louder. Listen to any talk show in the area and you kinds of get the idea that Illini Nation is not a happy bunch right now. Benn, who had only managed to catch one pass in the first two games, caught 4 against the Buckeyes, nowhere near the amount that he should be getting on a per-game basis. So is Juice the problem? Is he not looking downfield like he should? New offensive coordinator Mike Schultz promised that the offense wouldn't change when he was hired, but so far this season it appears that it has taken an extended vacation with Williams at the helm. Other players that were either recruited or transferred in have played into this in a way. Senior wide receiver Jeff Cumberland, who is from Columbus, Ohio, switched from tight end and when he committed to Illinois, people thought we had stolen one away from the Buckeyes in their own back yard. Could it be that Ohio State coach Jim Tressel knew what he was getting with Cumberland and didn't make that hard of a push to get him? Again, hard to tell, but you have to think somewhat along those lines to make sense of it. The same thought process applies to Jarred Fayson, who transferred from Florida at the beginning of last season. For Florida to not want Fayson anymore, there must have been something that was not right. After watching Fayson the first few games this year, his first live action since arriving in Champaign, we may be finding out what that reason is. He has dropped several passes, some of them that easily could have been caught. The continuation of mistakes and penalties haven't made this season any more enjoyable, but maybe it is time for a change to McGee. Is Illinois a school with a football problem? You hear it every day that the Big Ten is comprised of the Big 3 and Little 8 year after year, with the 3 being Ohio State, Michigan and Penn State, in no particular order. Sure, other teams sneak into that top tier every once in a while, but when you think Big Ten football, those first three schools come to mind first. Illinois has been mediocre in football for many years, and not since the John Mackovic era has the Illini regularly been bowling. That is nearly 20 years for those that are keeping count, and putting up with Lou Tepper, Ron Turner and now Ron Zook with middle-or-the-road results, one wonders if it time for another change? Could it be the athletic director, Ron Guenther? Priding himself as a football guy, Guenther has been in charge for the last 3 hires, so if he claims to know football backwards and forwards, maybe he should start with naming a coach that will take Illinois to the next level. The way the program is headed, that won't happen for quite some time. This week, the Illini return to Memorial Stadium to entertain Penn State (2:30 pm, ABC), who was an upset victim to Iowa last Saturday 21-10 in Happy Valley. The Nittany Lions, who are coached by legendary coach Joe Paterno, are perennially one of the top teams in the Big Ten, and this loss notwithstanding, still figure to give the Illini a handful on Saturday. Led by dual threat quarterback Darryl Clark, Penn State enters play at 3-1 overall and 0-1 in the conference standings. The Nittany Lions also return running back Evan Royster, which means that the Illini will need to be on their toes on both sides of the ball in order to pull off the upset at home. Given the rocky start to the season, that is a tall order at this point. But, who knows? The Fighting Illini return to the field this Saturday to take on the Ohio State Buckeyes at the Horseshoe in Columbus. But before we look ahead to this matchup, let's take a look back at the opening win against the Illinois State Redbirds, a 45-17 rout against their neighbors to the west. However, the win over ISU didn't come without some adversity, as the Illini lost two players during the game, quarterback Juice Williams and linebacker Martez Wilson. The two injuries were vastly different, as Juice's occurred on the first play from scrimmage as he strutted down the sidelines toward the endzone. He came up lame just shy of the goal line, and what ended up being a strained quadricep muscle shelved him for the remainder of the game. Later on, the Coach Zook told the media that Juice could have played, but the doctors and trainers leaned toward the cautious side and kept him out of the game. So, that left Eddie McGee as the quarterback. McGee, who hasn't had the opportunity except for a few series' here and there, performed admirably, completing 13 of 17 passes for 164 yards and a touchdown pass to Chris Duvalt, which went for 27 yards. The news on Wilson wasn't as positive, as it was learned later on last week that 'Tez will miss the rest of the 2009 season with a neck injury. This is particularly disturbing news for the Illini, as Wilson was one of the rising start on defense and was just coming into his potential as a linebacker. Normally, a win against Illinois State should be a slam dunk, but give the Redbirds credit for not backing down against the more powerful Illini. Ron Zook liked the bye week exactly where it fell this year for the Illini. Nestled in the third week of the college football season, between a matchup against an in-state rival and the conference opener against aforementioned Ohio State (2:30 pm, ABC Regional television), the rest gave Zook and his players time to rest up, heal up, and get ready to take on the Buckeyes, a team that they have had some success against in recent years. As a matter of fact, just 2 years ago, the Illini went into Columbus and knocked off the top-ranked Buckeyes 28-21 to propel them to the Rose Bowl. It seems that the Illinois always gets up for the Buckeyes, especially over at The 'Shoe, but this one will be more of a monumental task than the previous one. First of all, Ohio State still has Terrelle Pryor, the dual threat quarterback that has still not reached his potential. Second, the Buckeyes are playing decent football, although they needed a miracle to beat Navy and lost to then #3 USC 18-15. That being said, the Illini haven't exactly been impressing the masses thus far in the season either. Something tells me that this trip to Columbus won't be as pleasant as the last few have been. I hope I am wrong. The Illini women's soccer team has completed their non-conference portion of the season with a 5-3-1 record, which would seem not very impressive to most. However, it was a very tough pre-Big 10 slate, with the losses coming to UCLA at home, and Portland and Washington on the road. The Illini got back in the win column with a 3-1 win over Milwaukee on Sunday as Shayla Mutz recorded 2 goals to help the Illini to victory. Coach Janet Rayfield and the Illini will begin Big 10 play this coming Sunday when they host Minnesota (1:00 pm, Big Ten Network). The Illini women's volleyball team also have completed their pre-conference schedule, and they escaped with a 9-1 mark, the only blemish coming at the hands of Florida State in the New Mexico State Tournament earlier in the month. Coach Kevin Hambly has the Illini back to prominence, ranked #14 in the latest poll. The conference season begins this weekend for the Illini, with a pair of matches against Ohio State on Friday night and undefeated and top ranked Penn State on Saturday evening. The match against the Nittany Lions will be televised on the Big Ten Network. Both matches begin at 7:00 pm at Huff Hall. Speaking of Coach Hambly and the volleyball team, there is still time to pick up your free tickets to "Spike The Record"on Friday, October 16, featuring the Illini against Minnesota and former Illini coach Mike Hebert. The doors will open for the event at 5:30 with the volleyball match beginning at 6:30. But, that is just half of the fun for the night. Immediately following the volleyball game, the Illini men's and women's basketball teams will unveil their squads for the 2009-2010 season. Tickets are available around the Champaign-Urbana area, as well as a limited number of tickets at the WGCY studios. News and notes around the men's basketball program are starting to heat up as the start of practice draws closer. Freshman Joseph Bertrand had surgery on his knee and is expected to be out a few weeks while he recuperates. Everyone else seems to be healthy, something that Coach Bruce Weber hopes continues into the season and beyond. And they're off.......... The fall sports season at the University of Illinois, that is. When late August rolls around each year on the Urbana-Champaign campus, two things are certain. First, the students will all descend back on campus for the fall semester, and the sports teams will begin play in earnest as well. The Illini football team has been preparing for their opening game of the season for nearly a month now, and that day has finally arrived. The Illini took on Missouri in the State Farm Arch Rivalry Classic at the Edward Jones Dome in St. Louis, Missouri. The game began with the Illini having first possession, and moving the ball into Tiger territory before having to punt the football. Missouri started deep in their own territory and moved the ball pretty well against the Illini, something that a lot of teams were able to do a year ago. The 14 play, 79 yard drive ended with a 35 yard field goal for a quick 3-0 Tiger lead. Added to the fact was Arrelious "Regus" Benn, who hobbled off early in the game with an apparent injury. 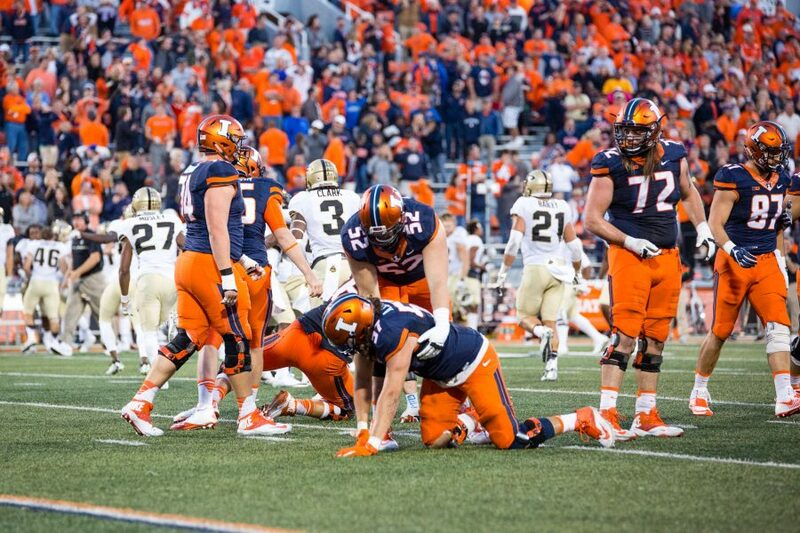 After a second straight punt by Anthony Santella, the Tigers took advantage of some shoddy tackling and penalties by the Illini to continue to move the football. Missouri added a touchdown on a blown coverage to increase their lead to 10-0. You might have thought that the Illini defense would have improved over last season, but early on, that was not the case at all. However, on the very next Illini drive, Williams finally got it together and drove down deep in Missouri territory, where the Illini had to settle for a field goal by Matt Eller to cut the lead to 10-3. The teams traded drives with nothing doing, then Illinois got the ball again and was driving before Juice Williams threw an interception that was returned deep into Illini territory. That drive resulted in a Missouri field goal from 43 yards out to extend the Tiger lead to 13-3. It was evident at that point that the Illini were missing Benn, who did not return in the first half. Even a brief quarterback switch to Eddie McGee didn't seem to help, although the Illini did drive deep before coming to grips with a 4th and 1, which ended in a drop back fall by Williams to stall the drive. On Missouri's next possession, they drove down the field once again, taking up quite a bit of clock in the process to kick a field goal just before the half. That gave the Tigers a 16-3 lead into the locker room. Coming out for the second half, Missouri picked up right where they left off as they moved the chains down the field to score yet another touchdown to build a commanding 23-3 lead. Wherever this potent Illini offense is, it appears that they were nowhere close to St. Louis. After another Illini drive stalled, this time on a fumble, Missouri went right back down the field and scored again, making it 30-3 and seemingly put the game out of reach. The Illini looked really out of sync and lost at times, and it was reported during the second half that both Benn and Jason Ford left the game with ankle injuries and would not return. This is not the way that Zook and the Illini wanted to start the season out, and now the Illini find themselves 0-5 in games in St. Louis and still winless against the Tigers. So, where do the Illini go from here? Zook has been saying for the past 4 years that they are not where they want to be as a team, but my question to that is, when does he plan to get there? He is getting some pretty good talent, but as losses continue to mount in big games, fandom starts to question coaching moves and then you have an unhappy Illini Nation on your hands. The change in offensive coordinators from Mike Locksley to Mike Schultz doesn't appear to show any difference, judging by the lackluster performance against the Tigers. If there is one bright spot for the Illini, it is that they get a chance to redeem themselves against in-state rival Illinois State this coming Saturday evening in the home opener. The Redbirds, who are coached by former Purdue assistant Brock Spack, always seem to get up for Illinois and if the Illini aren't careful, they could get embarrassed at home. The possibility of this however, is unlikely, as the Illini players will be looking for a way to make a statement for their no-show performance in St. Louis. Whatever the case, it better happen quick before the fans start turning themselves away and start focusing on basketball, which is just a few short months away. With training camp beyond the halfway point in completion, some interesting battles are being had on Ron Zook's football team. Offensively, there isn't much different, as previously noted, but playing time might become a factor once everyone hits their stride. Defensively, it is a different story. We all know that the Illini have the capability to put a lot of points on the board, but keeping the other team from doing the same may be the difference between a mediocre season and one that is deemed special. Veterans Doug Pilcher and Clay Nurse return on the line, as well as Josh Brent. Brent, as many are aware, had some off-the-field problems that led to his being suspended for a brief time during spring workouts. But, all seems to be well again and he is back in the mix of things. Sirrod Williams also returns, as does Cory Liuget, the outstanding sophomore from Florida. The presence of these behemoths will go a long way towards the success of the defense. Linebacker looks to be a position that will see an overhaul with the loss of Brit Miller to the NFL. Nate Bussey, who played in the secondary last season, moves into the position with Dere Hicks, Dustin Jefferson, Ian Thomas and Martez Wilson. Wilson is the stalwart on defense, and seems to be built even more than he was last season, which can only be good news to Zook and company. To replace Bussey in the secondary, Miami Thomas, Supo Sanni, and a couple of freshmen, Walter Aikens and Joelil Thrash may be asked to step into the fire. Bo Flowers, Russell Ellington and Tavon Wilson will also be there, which provides even more stability. After the annual Rantoul scrimmage last Saturday evening, the offense proved that they will be lethal, with a handful of big plays from scrimmage. Daniel Dufrene broke an 80 yard run on the first play, and later on, Juice Williams hit wide reciever Jeff Cumberland down the sideline for 70 plus yards. It will be plays like these that will make the 2009 edition of the Fighting Illini exciting to watch. What remains to be seen is how the defense will hold up. Continuing my look at the Big Ten for 2009, this week focuses on the bottom 6 teams, in no particular order. The Wisconsin Badgers are known for their beefy offensive lines, and they may need them more than ever this season. On a team that went 7-6 in 2008, they lost their top rusher, as well as three kee members of their offensive line. Coach Bret Bielema will need to find replacements for those spots to improve on their record from a year ago. Quarterback Dustin Sherer, as well as a couple of his top receivers, so that is not a far-fetched goal. Northwestern is a team that is hard to figure. The Wildcats are coached by a great young mind in Pat Fitzgerald, but they are going to be without three of their offensive weapons of a year ago when they finished 9-4 overall and 5-3 in the conference. Quarterback C. J. Bacher, tailback Tyrell Sutton and wideout Eric Peterman are all gone, leaving not much in its wake. Purdue will be under new leadership this season following the retirement of Joe Tiller. All Tiller did in his 12 seasons leading the Boilermakers was take them to 11 bowl games, a tremendous accomplishment for a school that hadn't been to a bowl game for 13 years before his arrival. New coach Danny Hope will inherit a team that lost quarterback Curtis Painter and wide receiver Greg Orton, but returns almost their entire offensive line. For Purdue to have the success that Tiller instilled to the program, that offensive front will need to protect the new signal caller. Indiana might be in for a long season, losing perhaps one of their best players in quite some time, Kellen Lewis, who was a great option quarterback. Also losing their top running back Marcus Thigpen, as well as their placekicker Austin Starr from a team that went just 3-9 overall and 1-7 in league play a year ago, means that a rebuilding year is on the horizon. The Iowa Hawkeyes return their quarterback from a team that finished 9-4 a year ago, and it will be up to Ricky Stanzi to lead the offense to bigger and better things in 2009. However, replacing running back Shonn Greene will be a question that coach Kirk Ferentz will have to deal with in terms of where the scoring will come from. Iowa has had marked success in the past few years, so being there before may just be the anecdote that they need. Finally, the Minnesota Golden Gophers return 53 letterwinners from a year ago, including quarterback Adam Weber and receivers Eric Decker and Brandon Green. Coach Tim Brewster, who led the Gophers to a bowl game last year, finished the season at 7-6 overall. Minnesota will unveil TCF Bank Stadium this fall, a brand new outdoor stadium that will replace the Metrodome. Can you imagine football in November, in Minnesota outdoors? Opponents must be cringing at that very thought. Anyway, that is a look at the conference for 2009. The Fighting Illini open the regular season in about 2 weeks in St. Louis in the annual border battle against Missouri. Should be exciting! Remember, please follow me on Twitter at www.twitter.com/Illiniguy1063. I welcome comments and suggestions as well. What time is it when eleven football coaches that comprise the Big Ten Conference get together to discuss the upcoming season? Why, the start of football, and sadly, the beginning of the end of summer. The Big Ten held their Media Days at the Hyatt Regency in Chicago last Monday and Tuesday, and if what they had to say was any indication, this should be quite a football season in the midwest. As is normally the case at the start of the season, optimism runs at a fever pitch, and that is certainly no different for Ron Zook and his Illini squad. Back for his senior season, Juice Williams will lead the Illini into Camp Rantoul as the #1 signal caller, with Eddie McGee, Jacob Charest and true freshman Nathan Scheelhaase waiting in the wings in case anything goes wrong. Williams, along with Arrelious Benn and defensive lineman Doug Pilcher, were representing the Illini at the meetings, and the throng of media that attended asked them some pretty demanding questions. Juice has been around this for awhile, as has Benn, but Pilcher is a bit newer to all of this, but still handled himself pretty well. The media collectively picked Ohio State to finish first, Penn State to finish second, and Michigan State to finish third in the conference, which seems about right, given what each school brings to the table. The Buckeyes and Nittany Lions are well versed in coaching, with veterans Jim Tressel and Joe Paterno respectively leading the charge. Joe Pa, who has been at the helm at Penn State for what seems like forever, says that he keeps coming back year after year because he enjoys it and doesn't know what else he would do. Darryl Clark leads Penn State at quarterback, but it might be the offensive line that determines how well they do. The line is inexperienced, and according to Paterno, some of the younger players are going to have to step up for them. Paterno never ceases to amaze me with his wit and wisdom, and should be the model for most coaches today. Ohio State will once again be led by their signal caller Terrelle Pryor, who was the first Buckeye to start at quarterback as a freshman in over 30 years. Pryor, who can run as well as pass, poses as good of a dual threat as there is in college football today. But, as most teams have found out, playing big games out of conference on the road can prove disastrous. They lost badly to USC last season, but this year the Trojans come to Columbus to play. The Buckeyes also host Navy in the season opener, and go to Cleveland to play Toledo, which, according to Tressel, won't be easy. Then, the conference opener against Zook and the Illini, which has given Ohio State fits over the years. You can't argue about their pre-conference schedule. Michigan State has been steady over the years, and with their coach Mark D'Antonio, the trend has definitely continued. However, the Spartans lost quite a bit of star power when they lost Javon Ringer at the end of last season. Ringer was quite a player, and they will have to replace him in order to stabilize their recent success. They may have a sleeper in linebacker Greg Jones, whom D'Antonio seems to be pretty high on. Only time will tell as to how good the Spartans will be. Michigan fell back to reality last season, missing a bowl game for the first time in quite a while under new coach Rich Rodriguez. Coming from West Virginia and the Big East, Rodriguez sees some differences between the two conferences, but also noted that some of the teams in the Big East were no slouches. The Wolverines will concentrate on the defensive side of the ball, since there will be a new coordinator calling the shots. One of the players that Rodriguez brought with him was punter Zoltan Mesko, who should be one of the top kickers in the conference this coming season. Michigan cannot do much worse than they did last season, so the sky is the limit for them this season. Coming up next week, the remainder of the Big Ten will be previewed, as well as a report on week 1 of practice from Illini camp. Illinois hosts their media day on Sunday, August 9th, and as a trend that is apparently happening across the country in this lean economy is the elimination of media guides distributed. At the Big Ten media day, all media in attendance were given a flash drive that had all 11 Big Ten teams' guides, as well as conference information. Not sure if Illinois is following that trend and will print some, but in the quest to become "greener", that is the norm nowadays. Even though football season has yet to start, Illini basketball also is making some news of its own. In conjunction with Illini Madness, the Illinois volleyball team will look to "Spike The Record" at Assembly Hall on October 16 when the Fighting Illini battle Minnesota. New coach Kevin Hambly is very excited to be a part of this venture that will feature a volleyball match that will start at 6:30 that evening, which is to be followed by the men's and women's basketball teams conducting their event. In the past, such events such as the "Pink Out" and the "World's Largest Outdoor Basketball Practice", marketing genius Chris Hanna hopes to top them all with this latest venture. Tickets will be free to the event and will be distributed throughout the area. 125,000 such tickets will be given out, with only the first 16,600 inside the Assembly Hall guaranteed a seat. Once the hall is filled, people will be turned away. By the way, the NCAA record for volleyball attendance is 13,797, the mark that the Illini hope to break. Stay tuned to more details on this event as it draws closer.